Ok, so I like baking with bananas. I bought a few to make cookies to send to my grandmother (that’s a separate blog post! ), and I bought a few extra also. I told the husband that he could eat them if he wanted to, because last time I bought extra bananas, I nearly chopped his hand off when he went to take one. By the middle of last week, none of the bananas had been eaten. Husband was working from home, so I told him to grab all my Baked books (yep, I have four) and pick a banana recipe for me to make. He chose a recipe from Baked Elements, which is a really cool dessert cookbook that has the recipes put into categories based on their main ingredient. This is a recipe that could have gone in the banana category or the peanut butter category, but the Baked guys chose to put it in the peanut butter category. Bananas were definitely included, but the peanut butter is the reason that the husband chose it, so peanut butter is certainly an acceptable choice. So we put together the dry ingredients and make a nice little well in the center. 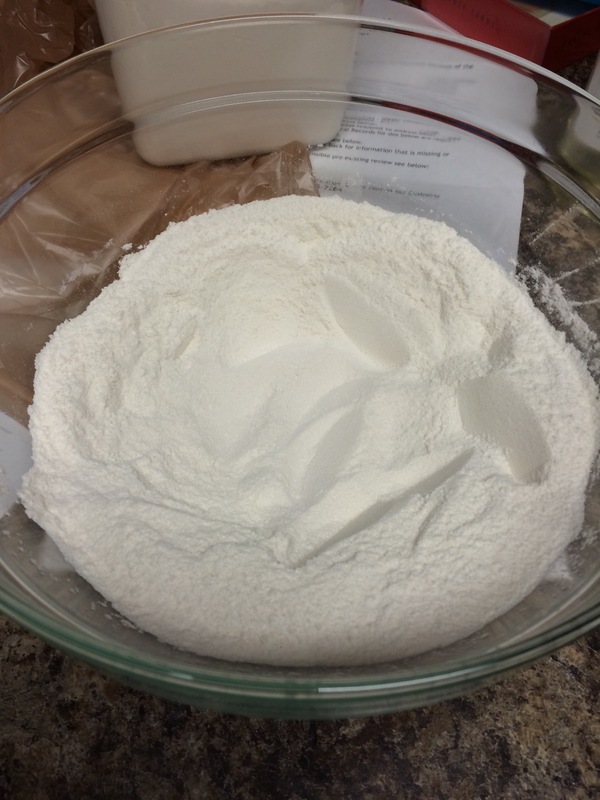 Nothing unusual here – flour, salt, etc. 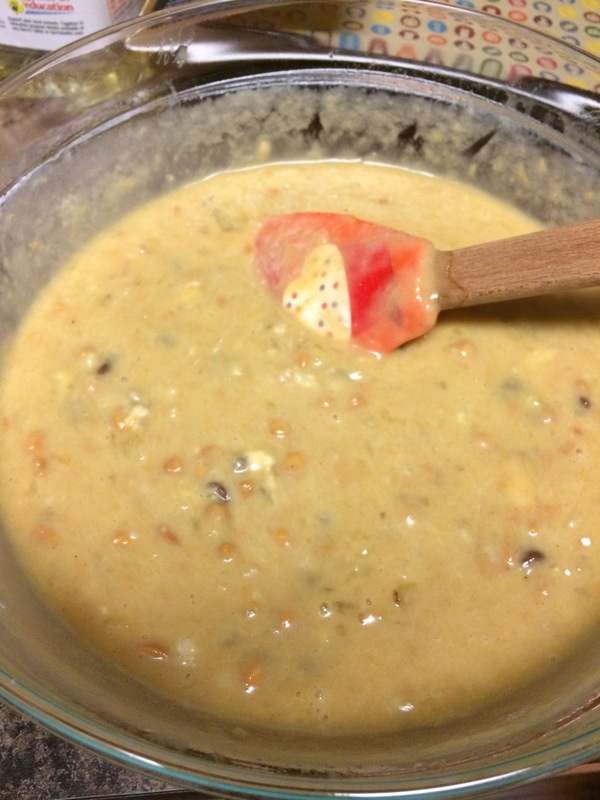 I hate to say it, but the wet ingredients mixed together looked pretty unappetizing. I won’t tell you what I thought it looked like, but I’m sure you can guess. The light brown bits are peanuts and the darker brown bits are chocolate chips! 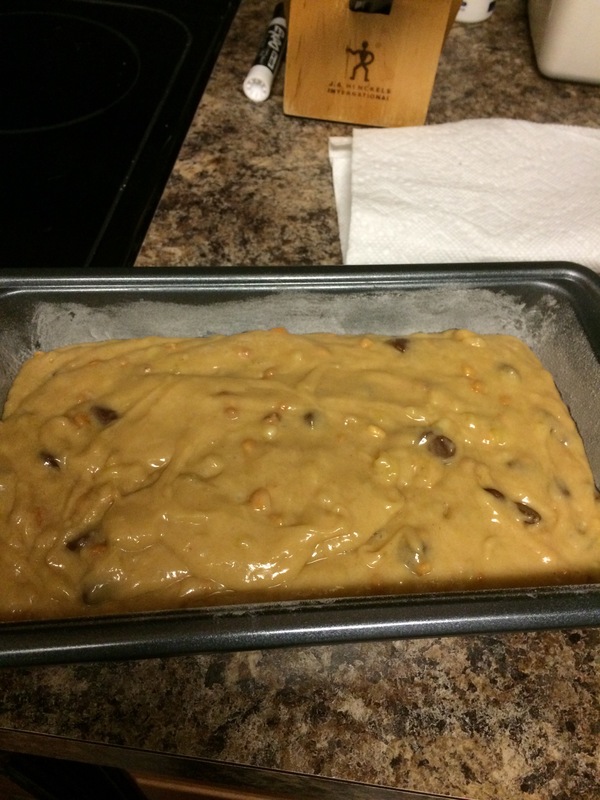 The whole thing looked much better when it was all mixed together and put in a loaf pan, fortunately. This made the house smell DELICIOUS. Yummy! 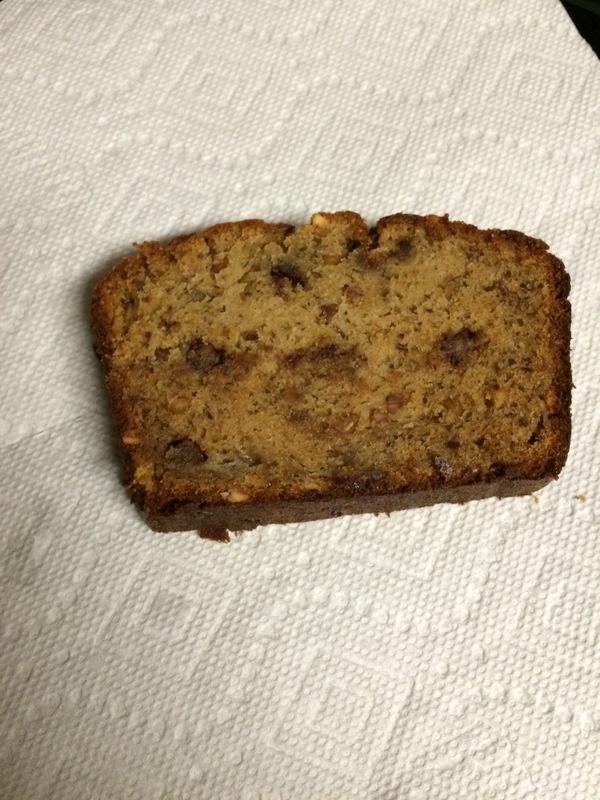 The only problem I have with banana bread is that it’s hard to tell when it’s done. The toothpick inserted in the center never comes out clean! This loaf ended up with a bit of a “crust” around the edges, which was not bad, but not my favorite thing. Any tips on knowing when banana bread is done? The only tweak I made to this recipe was using milk chocolate chips instead of semi-sweet, only because that was the kind of chocolate chips that were in my house. I will definitely make this again! I’m not ashamed to say that the two of us ate it for breakfast every morning until it was gone. I’ve found that if the center LOOKS done (not too shiny) and if it springs back when you press on it lightly, it’s done. 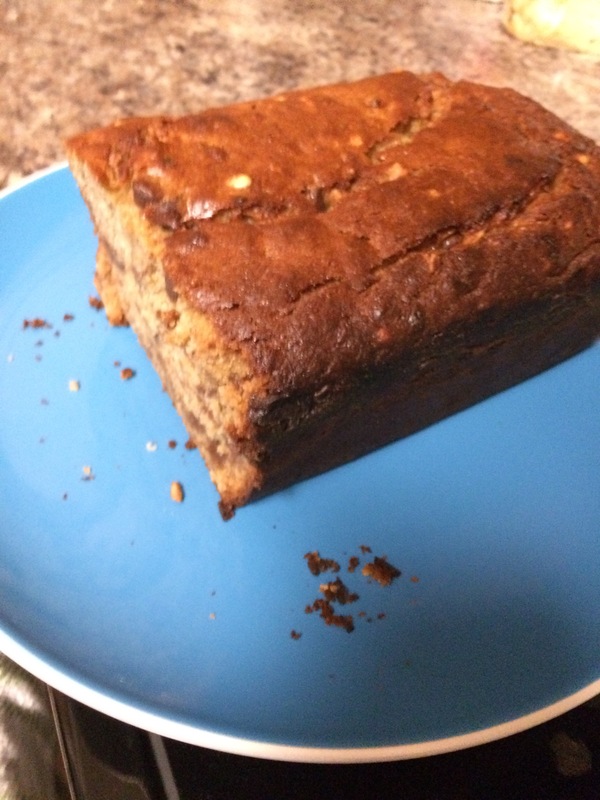 I tried a pb banana bread once and it turned out gross so I’ve been scared to try again.